Product prices and availability are accurate as of 2019-04-04 01:30:05 EDT and are subject to change. Any price and availability information displayed on http://www.amazon.com/ at the time of purchase will apply to the purchase of this product. 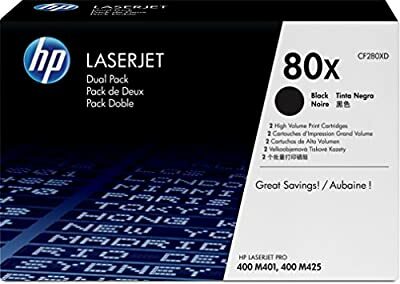 HP 80X (CF280X) Black Toner Cartridge High Yield, 2 Toner Cartridges (CF280XD) for HP LaserJet Pro M401 M425. HP 80X (CF280XD) toner cartridges work with: HP LaserJet Pro M401, M425. Save up to 25% with high-yield HP toner. HP 80X toner cartridge yield (approx.) per cartridge: 6,900 pages. 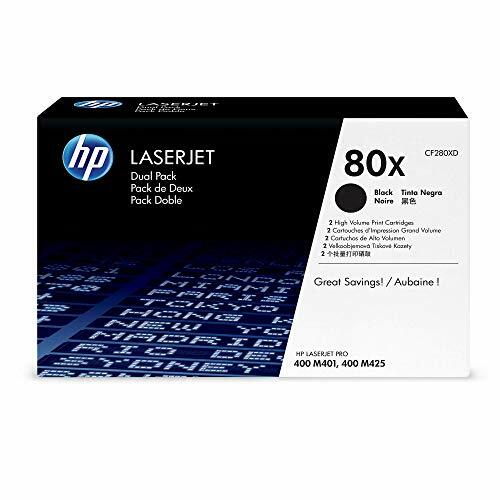 Save money—get double the print volume at a lower price with 2 Original HP 80X (CF280X) cartridges in one package (CF280XD). See 80A (CF280A) for standard size option of HP 80 black toner. Ensure that your printing is right the first time and every time with HP printer toner: 80X toner. What's in the box: 2 New Original HP 80X (CF280X) toner cartidges in one package (CF280XD). Color: Black. Color: Black Original HP Cartridge Yield (approx) per cartridge: 6,900 pages Stretch your printing budget. 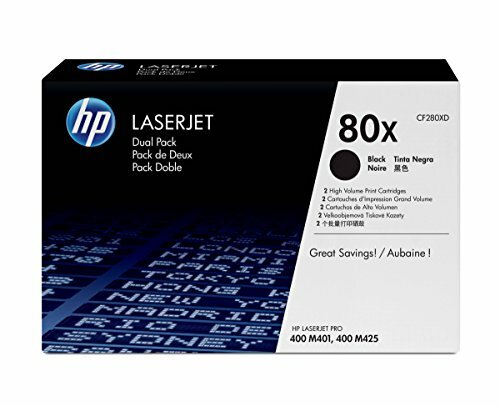 Original HP LaserJet high-capacity dual packs offer a better value than individual cartridges. Print more pages for less with two high-capacity cartridges packaged together. Save on shipping - only one product to order Stay productive and save time. Reduce shopping trips - choose two high-capacity cartridges packaged together instead of individual cartridges. Decrease downtime by keeping an extra cartridge on hand. Intuitive design makes replacing cartridges easy What's in the Box: New Original HP (genuine) toner cartridges HP Printer compatibility: HP LaserJet Pro M401, M425.